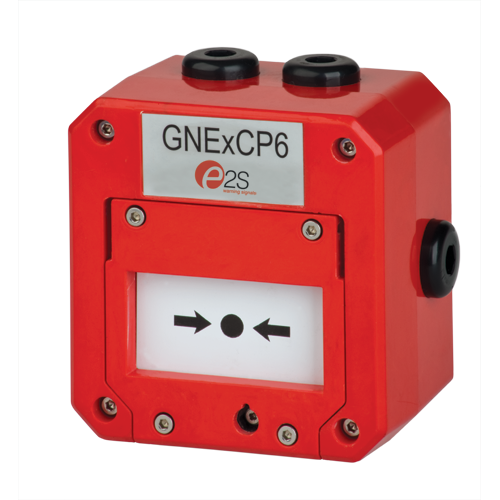 The GNExCP6 Explosion Proof Manual Call Points are available as break glass, push button or tool reset versions. They are approved for Zone 1, 2, 21 and 22 hazardous areas for the control of fire and gas alarm systems. Available with either single or double pole change over switches. 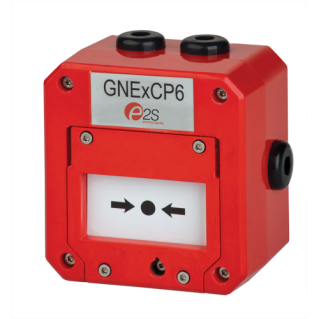 All versions are certified to ATEX and IECEx standards. – Break glass or push button manual call points. – Ex e d IIC zone 1, 2, 21 and 22 (IECEx). – Single or double pole switch. – Optional stainless steel lift flap. – Optional series and EOL resistors (CP6B only). – Input Voltage/Current: CP6A – 250VAC max, 5.0A max, 50VDC max, 1.0A max; CP6B – 48VDC, 0.75A max, 24VDC, 1.0A max. – Terminals: CP6A – 6 x 4mm squared, CP6B – 6 x 4mm squared or 8 x 2.5mm squared DIN rail. – Temp Rating (degrees Celsius): T6 -40 to +55 (CP6B +50). – Cable Entry: 3 x M20 clearance holes top, bottom and side. – Construction: GRP (glass reinforced polyester). – Approval: CP6A – II 2G Ex e d IIC T6, II 2D Ex t IIIC T60 degrees Celsius; CP6B – II 2G Ex e d mb IIC T4 (max ambient temperature +50 degrees Celsius), II 2D Ex t IIIC T80 degrees Celsius. – Certificate: IECEx (SIR 09.0121X). ESSG05520R**** CP6A BG break glass, red housing no flap, no duty label, 2 C0 contacts. ESSG05520Y**** CP6A BG break glass, yellow housing, no flap, no duty rating, 2 C0 contacts. ESSG05523R**** CP6B BG break glass, red housing, no flap, no duty label, 2 C0 contacts. ESSG05523Y**** CP6B BG break glass, yellow housing no flap, no duty label, 2 C0 contacts. ESSG05521R**** CP6A PB push button, red housing, no flap, no duty label, 2 C0 contacts. ESSG05521Y**** CP6A PB push button, yellow housing, no flap, no duty label, 2 C0 contacts. 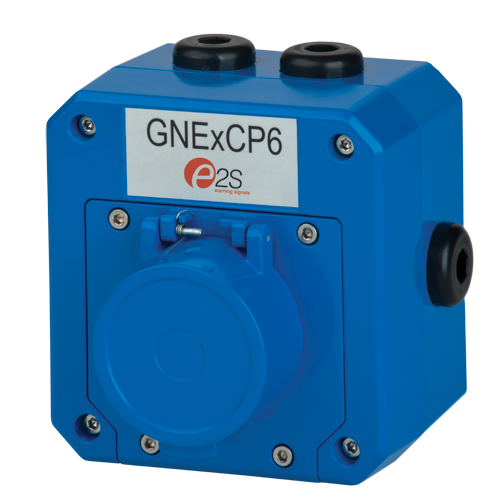 ESSG05525R**** CP6B PB push button, red housing, no flap, no duty label, 2 C0 contacts. ESSG05525Y**** CP6B PB push button, yellow housing, no flap, no duty label, 2 C0 contacts. ESSG05524R**** CP6A PT push button, tool rest red housing, no flap, no duty label 2 C0 contacts. ESSG05524Y**** CP6A PT push button, tool rest yellow housing, no flap, no duty label, 2 C0 contacts. ESSG05526R**** CP6B PT push button, tool rest red housing, no flap, no duty label, 2 C0 contacts. ESSG05526Y**** CP6B PT push button, tool rest yellow housing, no flap, no duty label 2 C0 contacts. ESSG05909 Replacement glass CP6/CP8 Accessories. *Add F for flap option, *Add D for duty label option, *Add L for LED, *Add E for end of line resistor (with resistor value), *Add S for series resistor (with resistor value). 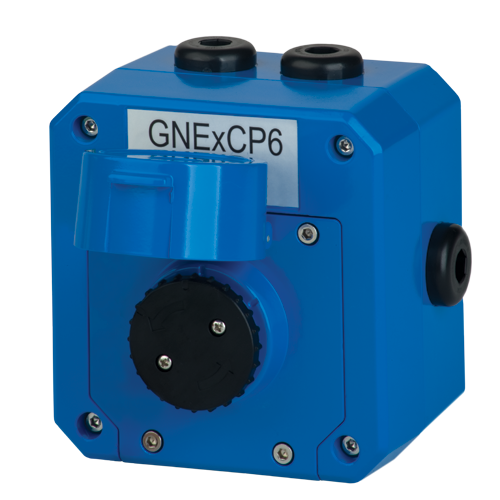 Note: For applications that do not require monitoring resistors, diodes or indicator LED’s order the GNExCP6A version.